PennDOT has announced several projects this year for Lawrence County and northern Beaver County, including the replacement of four bridges. In a list of upcoming projects released Monday by PennDOT, officials noted one of the major projects will be the ongoing replacement of the Koppel Bridge along Route 351, linking Koppel and North Sewickley Township. The $27.58 million project will continue this spring with the erection of a steel pier and retaining wall for the new bridge. Traffic will continue on the existing bridge while construction continues. The bridge will be closed and traffic detoured for about three months in summer 2019 for the switch, according to the PennDOT release. The Portersville Road Bridge along Route 488 between Hickernell and Wurtemburg roads in Perry Township will be replaced starting in March. The $5.29 million project is expected to be completed in August. Minor work is expected to begin this year on the $1 million to $2 million replacement of the Fombell Road Bridge over Camp Run in Franklin Township. In addition to the superstructure replacement, which will require a detour, substructure replacement and approach road work will occur. The overall project is set to be finished by September 2019. The Wampum Avenue Bridge on Route 288 between Mason and Oswald Streets in Wayne Township this fall. The estimated $9 million to $10 million project will include full replacement of the bridge and miscellaneous construction improvements, including a reconfiguration of Wampum Road at Oswald. One lane in each direction will be closed to traffic. One weekend closure will be required to connect the existing road to the new structure. This project is to be completed in December. Continuing resurfacing of Mercer Road in Perry Township. Resurfacing and drainage improvements on Main Street from River Road to near Oswald in Wayne Township and Route 388 from Route 422 to Eastbrook-Volant Road in various municipalities. More than 4 miles of Route 168 between Galilee Road near Route 18 in North Beaver Township and Moravia Road in Taylor Township will be resurfaced and drainage, curbs and guardrail improvements made as part of a $10 million to $12 million project. Work is expected to begin in May and continue through the 2019 construction season. Harris Bridge on Mountville Road between Heinz Camp and Ny roads in Perry and Slippert Rock townships will be rehabilitated beginning in early March. 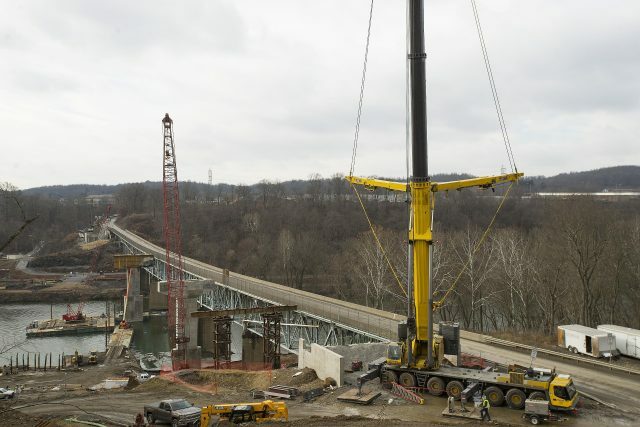 The $2.37 million project on the bridge over Slippery Rock Creek will include replacement of the truss floor system, decks, barriers, bearings and one wingwall. Additional work will be substructure concrete repairs, structural steel fixes, full painting of the bridge and guardrail updates. The bridge will be closed until November, when the work is expected to be completed. Work will begin on the Chapel Drive Bridge over the Connoquennessing Creek in North Sewickley Township this summer and last approximately six weeks. The $100,000 to $200,000 bridge rehabiliation will replace the existing corrugated metal pipe culvert with a new precast reinforced concrete box culvert. To allow crews to place the culvert, a full closure of the bridge will occur and traffic will be detoured around the area. A $1 million to $2 million rehabilitation of the New Galille Road Bridge over the north fork of Little Beaver Creek in Darlington Township is expected to begin in August. Traffic will be detoured as crews repair concrete and other superstructure work. The overall project is set to be done in mid-November 2019. Resurfacing and drainage improvements on Old Darlington Road from just north of Marlene Road to Wallace Run Road in South Beaver Township. The Beaver Valley Expressway will be restricted at various times between Chippewa Township and the Allegheny County line beginning in March for a $18.34 million improvement project that will include highway lighting, guardrail upgrades, sign installations and repaving. The work is expected to be completed by early summer. During these projects and other road work, PennDOT urges motorists to drive cautiously in work zones and obey all traffic rules. Fines can be doubled in active work zones. To monitor road conditions and detours, go to 511PA.com or use the smartphone application by dialing 511. Motorists also can follow regional Twitter alerts through the website.